Adam graduated from the University of Dundee in 2009 with an honours degree in neuroscience, however after not being impressed with the career opportunities available following on from this he started a long and methodical search for the ideal career. During this search he found chiropractic, and was extremely impressed by the improvement in pain and function so many people experienced from various treatments administered by chiropractors mainly by using only their hands. This led to a burning desire to become a chiropractor himself. 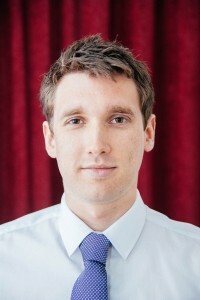 Five years later he graduated from the Anglo European College of Chiropractic, and now uses a variety of hands on chiropractic techniques along with other modalities ( such as interferential and ultrasound) to help his patients. Prior to joining the team at Borders Chiropractic, Adam worked in a busy multidisciplinary clinic in Aberdeen. Adam is a member of the British Chiropractic Association and is in the process of completing the necessary further learning to become a full member of the Royal College of Chiropractors. Apart from his qualifications in neuroscience and chiropractic, Adam also completed a diploma in clinical hypnotherapy which he has finds useful both personally and professionally. In his spare time Adam enjoys salsa dancing, martial arts, running, and the occasional indoor rock climbing session. He believes that the fitness activities we undertake should utilise the whole body’s range of motion to maintain good overall body balance. He also enjoys playing the piano!